I’m unsure where this all started and who was the first to break the tradition but when it came to the 32 pin 1Mbit EPROM some manufacturers went rogue. 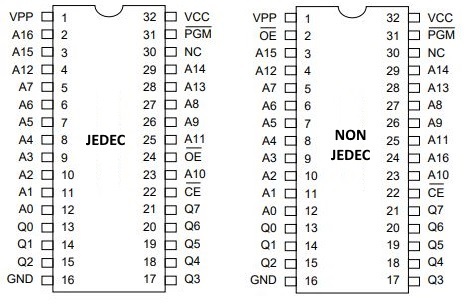 The difference between a JEDEC pinout and a non-JEDEC pinout is two pins swapped. The signals in question are /OE and A16 and the pins are pin 2 and pin 24. Normally this information would be all we need to know. For example Macronix has the MX27C1000 eprom which has a JEDEC pinout. They also have the MX27C1001 which has a non-JEDEC pinout. The confusion starts to creep in if you wanted to replace a Macronix MX27C1000 EPROM with say Sony’s CXK27C1000. Its a natural assumption to make that these two are going to pin compatible but that is where we would be wrong. Sony’s CXK27C1001 is actually the JEDEC pinout and the CXK27C1000 is the non-JEDEC pinout. I believe that all manufacturers of the 27C010 use the JEDEC standard pinout. Here is a table that we have put together that hopefully captures all the variants and their pinout type. So if your replacing an EPROM of this type then make sure the EPROM you have is the correct pinout or your going to get problems. Thanks to Caius and Simonden for their help putting the list together.